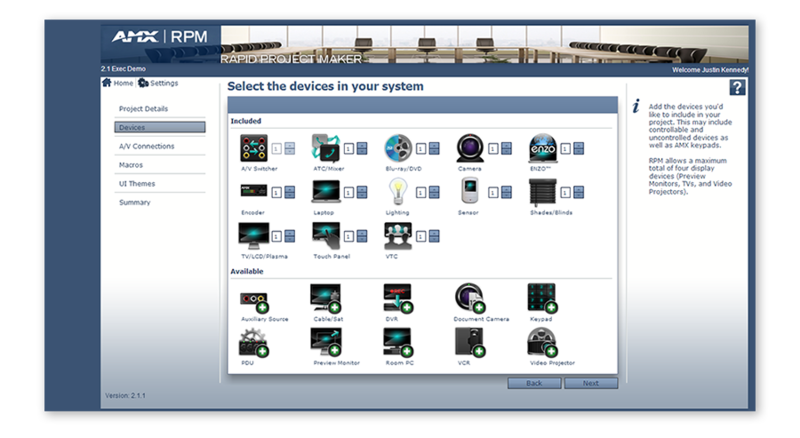 Rapid Project Maker / NSS-RPM is a cloud-based software configuration tool that allows AV technicians or IT professionals to easily configure a new or newly modified AMX system by using a step-by-step wizard-based approach. RPM simplifies more than just the configuration - it is a comprehensive tool designed to help throughout the commissioning process, from start to finish. With no programming required, the user can configure the project, create a user interface and generate step-by-step instructions on how to install the system. Users can store their projects on AMX.com, allowing them to access and manage them from anywhere. Since its inception, RPM has added several valuable new capabilities including exciting new User Interface template options, support for dual rooms, Enzo control options and usability options for videoconferencing. RPM takes the time, frustration and difficulty out of automating conference room control systems. Visit our RPM portal, www.amxrpm.com, to learn how you can use RPM to deploy the Perfect Meeting today.